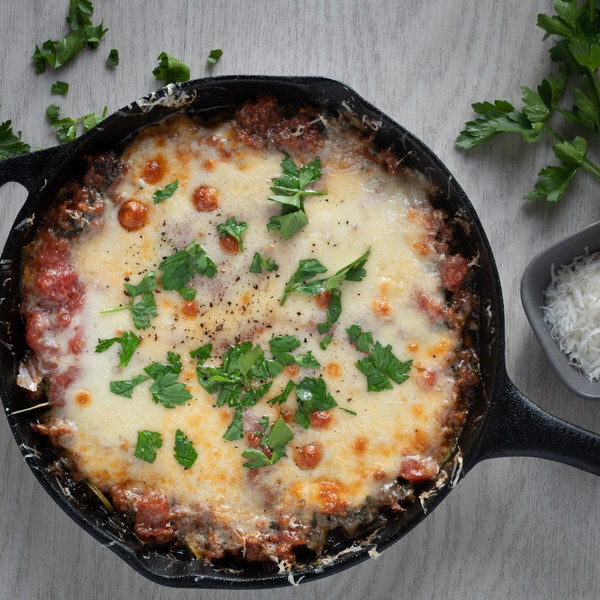 ← Cheesy Zucchini Noodle Lasagna Skillet . Peel and mince or press garlic. Coat bottom of skillet with oil. Add ground beef and garlic. Break apart the beef with a spoon until crumbly. Stirring occasionally, cook until beef is browned, 4-6 minutes. Add the tomato paste and cook until fragrant, 1-2 minutes. Add the tomatoes and broth. Increase the heat to high and bring to a rapid simmer. Shave leaves off the parsley stems; discard the stems and mince the leaves. Pick basil leaves off the stems, roll up crosswise, and thinly slice into ribbons. Put some of the fresh herbs aside to use as garnish. Add the parsley, basil, spinach, salt, and pepper to the skillet. Continue to cook for another 4-5 minutes. Trim ends of the zucchini. Using a vegetable peeler, peel zucchini into thick noodle-like strips. Remove the tomato sauce from the skillet, and set aside in a bowl. Arrange the half of the zucchini in a flat layer that covers the bottom of the skillet. Pour half of the tomato mixture over top of the zucchini noodles. Then arrange a second layer of zucchini noodles, followed by a second layer of sauce. Thinly slice the mozzarella cheese. Finely grate the Parmesan cheese. Cover the top layer of sauce with the mozzarella slices and sprinkle with Parmesan, place in the oven for 10-12 minutes. Put the oven to broil for the last few minutes to brown the top if desired. Divide between plates, garnish with remaining fresh herbs, and enjoy!